I stood in a spruce grove just as the sun rose on a cool morning in late June, I closed my eyes and used my other senses to explore this special place on the coast of Maine. The air had that clean taste found only in wild places. I could smell the turpentine scent of the spruce trees. The sphagnum moss underfoot was soft and yielding. But what I sensed most immediately was the auditory riot of birdsong as males of many bird species—most of them warblers—advertised for mates and used song to defend their territories. From off to my left in the darkness of a brushy edge I heard the witchity-witchity-witchity call of a Common Yellowthroat. From higher up in a tall spruce came the distinctive four-note song of a Black-throated Green Warbler. In different directions I could hear at least four other warbler species, among them a very insistent Yellow-rumped Warbler in the tree right over my head and a more distant Black-and-white Warbler, whose song I always associate with the squeak of an unoiled wheel. Every spring, hundreds of millions of migratory warblers like these leave the tropics and fly north toward the lumpy, evergreen carpet of spruce trees and moss that covers hills and bogs from the eastern seaboard all the way west into Alaska. Wherever they settle, these birds vigorously defend their territories against neighboring males of their own species; this is one reason that the arrival of the warblers fills the spruce woods with song, as each male stakes his claim. In his research published in 1958, Robert MacArthur famously included sketches that noted the foraging differences among warblers in the spruce trees. For each warbler species, he denoted areas of the tree where that warbler species spent most of its feeding time (clockwise from top: Cape May, Blackburnian, Black-throated Green, Bay-breasted, and Yellow-rumped warbler). Illustration by Deborah Kaspari. Yet most of these birds share their territorial space with five or six other species of spruce-inhabiting warblers. A black-throated green and a yellow-rumped may occasionally squabble for a moment, but most of the time they ignore one other. The tree-sharing of these breeding warblers is just one example of the ecological phenomenon of coexistence, and for the first half of the 20th century it was a bit of a mystery: how do so many different warbler species manage to share the same habitat? Related warbler species share so many similarities in feeding and nesting habits that, in theory, they should compete acutely with one another, with only the best competitor species ultimately winning out to dominate the forest by itself. In the 1950s, a young graduate student named Robert MacArthur walked through these very same spruce woods and wondered himself about how warblers divide up their forest. He went on to publish one of the most-cited avian ecology studies of all time—Population Ecology of Some Warblers of Northeastern Coniferous Forests, a masterpiece that launched his illustrious career as one of the founding figures of the modern science of ecology. Last June, I walked this same woodlot in MacArthur’s footsteps with another young graduate student, birding while we mused together about how this classic piece of scientific literature has stood the test of time. Bik Wheeler, a Master’s candidate in search of a standout thesis project, was repeating Robert MacArthur’s original observations to track the changes in this bird community that have occurred in the intervening decades. I walked alongside Wheeler to indulge a dream: to walk through MacArthur’s spruce woods after my own 30 years of studying warblers in the field and the laboratory, and to visit for the first time a place—and its birds—that was part of my own inspiration to become a scientist. Graduate student Bik Wheeler of the College of the Atlantic is revisiting MacArthur’s spruce woods 60 years later, and he’s finding some different warblers that are showing up in different places—Black-throated Green (top, left) and Yellow-rumped (top, right) warblers still occur there in spruce trees, but American Redstarts (top, center), and Black-and-white and Magnolia warblers and Common Yellowthroats (bottom, left to right) are scattered throughout the forest as well. Today scientists know that species track food resources across landscapes, and that the population distribution of birds can fluidly change in space and time. Illustration by Chloe Lam, Bartels Science Illustration Intern. MacArthur discovered that the following five species of warblers on his study plots could coexist because each foraged in a different way and in different parts of a spruce tree. Blackburnian Warbler. Photo by Corey Hayes via Birdshare. Cape May Warbler. Photo by Glenn Bartley. Black-throated Green Warbler. Photo by Ryan Morrissey via Birdshare. Bay-breasted Warbler. Photo by Glenn Bartley. Yellow-rumped Warbler. Photo by Brian Small. All recordings from Macaulay Library’s Cornell Guide to Bird Sounds: Master Set for North America. MacArthur’s key insight from observing these Maine warblers was to show that foraging in the same trees did not mean that each species used their habitat in exactly the same way. By tracking where each type of warbler spent most of its time, MacArthur discovered that the five species on his study plots could coexist because each tended to specialize in foraging in a slightly different way in different parts of these spruce trees. The species did overlap considerably, but each had a part of the tree to which it seemed best suited: Blackburnian and Cape May warblers in the crowns of the trees, Black-throated Green and Bay-breasted warblers splitting the middle parts of the trees, and Yellow-rumped Warblers around the lower trunk and branches. 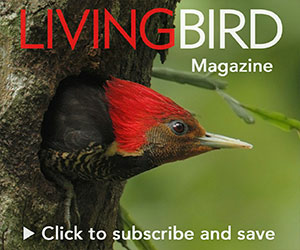 In essence, MacArthur found that instead of evolving differences in foraging morphology—like differing bills—these warblers had instead adopted differences in foraging behavior. MacArthur discovered that the five species on his study plots could coexist because each tended to specialize in foraging in a slightly different way in different parts of these spruce trees. MacArthur’s studies of these warblers helped launch his career, but this pioneer of ecology passed away in 1972 at the early age of only 42, long before I was old enough to read his writings. Although his studies of warblers became textbook exemplars of ecological coexistence, his Ph.D. thesis and other published works are not particularly clear about the exact location of his primary study sites. I had long since resigned myself to the idea that their location was probably lost to history. I was therefore particularly excited when I opened my mail to find a letter from Wheeler, who was then just beginning his graduate studies at the College of the Atlantic in Bar Harbor, Maine. I review proposals for a research grant program, and Wheeler was proposing to compare the bird community studied by MacArthur in the 1950s to the birds that live in those same trees today. He had researched and located MacArthur’s exact study site. A few emails and phone calls later, and I was off to Maine on an ornithological pilgrimage. I met Wheeler for the first time at five o’clock on that June morning in a parking lot on the coast of Acadia National Park. In a few hours this site would overflow with early summer tourists, but at this early hour we were the only people present to hear the warblers and other birds adding their voices to the dawn chorus. Wheeler pointed toward the woods to show how easy MacArthur’s famous study site is to find, once you know where to look: it is the sizable patch of spruce woodland just behind the Bass Harbor Head Lighthouse, a popular local landmark. In fact, you might even have an image of MacArthur’s site in your pocket or purse at this very moment, since the 2012 quarter coin that features Acadia National Park depicts this same lighthouse with MacArthur’s spruce trees easily visible in the background. Eastern spruce budworm is one of the most destructive native insects in the northern spruce and fir forests of the Eastern United States and Canada. Larvae go through 6 “instars,” starting off at a mere 2mm, and growing to about 2.5cm before pupating into a moth. Photo by Paul Williams. There are no formal trails away from the coastline, but the understory is fairly open and we walked easily into the woods. Well within the wooded study plot, I could still hear the clanking bells of navigation buoys, and the occasional squawk of a Great Black-backed Gull flying past above the tops of the spruce trees. But what struck me most was how poorly the trees matched my expectations. I had envisioned Robert MacArthur strolling through his study site with his neck sore from looking upward at warblers, notebook in hand as he recorded where they were foraging in the spruces. In my mind’s eye, those trees were living versions of his classic schematic diagrams: they stood in the regular ranks of a planted spruce plantation where every tree was the same age and nearly identical in height and shape, allowing the various warblers to separate themselves clearly into their separate feeding zones. But nature is messy. Instead of the overgrown Christmas-tree farm of my imagination, MacArthur’s site is a wild and unkempt forest, just as (I now realize) it must have been 60 years ago. A few old, emergent spruce trees rise to 80 feet or so and look something like the perfect pyramids in MacArthur’s published figures, but there are also smaller spruce trees of all sizes and shapes, along with pines and birches. Warbler species in Maine’s spruce woods have changed since MacArthur’s study. Black-throated Green and Yellow-rumped Warblers are still around, but the others have been replaced by the following warbler species. American Redstart. Photo by Mitch Vanbeekum via Birdshare. Common Yellowthroat. Photo by Ganesh Jayaraman via Birdshare. Black-and-white Warbler. Photo by Brian Hix via Birdshare. Magnolia Warbler. Photo by Brian Small. Yellow Warbler. Photo by Olivier Levasseur via Birdshare. It took only a minute for my ears to tell me that the warblers have changed, too. Two of MacArthur’s five species were clearly still around: at least four Black-throated Green Warblers were countersinging to one another, and that Yellow-rumped Warbler still sang loudly from somewhere in the tree right above us. Yet nowhere did I hear the Blackburnian, Cape May, or Bay-breasted warblers that MacArthur observed here in large numbers. Wheeler told me that those species no longer breed in these woods, and only occasionally pass through during migration. In place of those missing species, I heard other warblers: several American Redstarts back in the woods, the Common Yellowthroat in the bushes at the edge of the road, that squeaky-wheel song of a Black-and-white Warbler from a nearby birch tree, and both Magnolia and Yellow warblers singing from farther in the distance. It turns out that Robert MacArthur’s famous studies at this site were atypical even in his own day: they occurred during years of a massive outbreak small caterpillar called the spruce budworm. This budworm outbreak created an unusual richness of warbler food, and transient species such as Cape May Warblers that specialize in budworms moved in to take advantage of this abundance. Soon thereafter, the budworm outbreak here ended, and these warblers moved on to other places where budworms had become common. One of Wheeler’s research questions is whether the different combinations of warblers present at the site now still divide up the spruce trees, with each species specializing on a slightly different zone of the vegetation. Wheeler has the advantage of dictating his foraging observations into a digital recorder, but otherwise his approach mirrors that of MacArthur, with many hours in the woods spent in careful observation of birds as they move about the trees. Even after a single field season, Wheeler has discovered one truism: foraging warblers are very challenging to follow in dense vegetation, as these rapidly moving birds often disappear behind foliage or fly off to a distant tree. MacArthur’s sample sizes of warbler observations were surprisingly large given these difficulties, which he too must have encountered. Perhaps warblers overall were far more numerous in these woods in his years, or maybe he made multiple observations on the same bird in rapid succession, a method that we now understand to be statistically unadvisable but was standard practice in MacArthur’s day. In any event, it will take Wheeler another season or two to compile enough observations to contrast them with the classic patterns reported by MacArthur. Yet whatever Wheeler ultimately finds, his revisiting of this classic study system is bound to tell us something new about how bird species coexist across time in ecological communities, even beyond the foraging divisions that MacArthur documented in these woods. What is already clear is that—in addition to the ways in which these warblers divide up particular trees while foraging—the different species also respond in various ways to broader environmental variation in time and space. In these wider dynamics, each species does best under conditions that are slightly different. Put these two factors together—species that do slightly different things when they co-occur and that respond somewhat differently to habitat variation on a grander scale—and we can build on MacArthur’s insights. Warbler species mix and match in a grand variety of communities all across North America. This spruce woodlot on the coast of Maine still stands as an exemplar of how species coexist by being just a little different from one another. Irby J. Lovette is the Fuller Professor of Ornithology at the Cornell Lab and the lead editor of the forthcoming Handbook of Bird Biology.